If that is you, read on. For you are in the place of in-between. 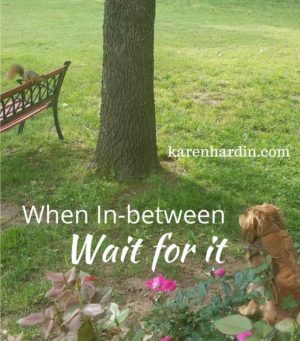 One of the most challenging places in life is the “in-between.” It is that place where patience is required and tested. It is where dreams live or die. As I walked onto our front porch recently I caught a visual of what it requires to successfully maneuver the in-betweens we encounter in life. As I stood on our front porch, I saw our dog, Darcy patiently waiting and watching a squirrel which sat on a bench just a few feet in front of her. She sat motionless watching for any sign of movement. The squirrels often taunt her allowing her to get close before they dart away. I’ve watched them climb down the tree toward her and chatter at her as they remain poised just out of reach on the trunk. Once she darts over, they race further up and out of her reach. But, no matter how many times this scenario repeats, Darcy refuses to give up. I have watched her stand at the bottom of one of our trees, in the rain, for an hour waiting on the squirrel she chased up to come down. She is relentless. Although she has never caught one, I believe she will one day. Why? Because she refuses to give up. She is patient. She is willing to simply wait. “Wait on the Lord; Be of good courage, And He shall strengthen your heart; Wait, I say, on the Lord!” Psalm 27:14. Waiting is one of the hardest things to do isn’t it? It’s seems so inactive. Sometimes we are just waiting as we tap our feet, cross and uncross our legs, look at our watch. We know and believe God is at work, but would He hurry up already! Are you in the place of in-between? The in-between may seem like an inconsequential part in our journey, but in actuality it is extremely important. It is a place of faith where we have the opportunity to go higher. The word “between” in Hebrew is the word bayin. It means “the interval.” As I study that in scripture it holds significant meaning. There are many “in-between” places in scripture. Think of David as he faced Goliath. He stood with his brothers and the Israelite army one side. The Philistines and their intimidating champion stood facing them on the other side. “The Philistines occupied one hill and the Israelites another, with the valley between them” I Samuel 17:3. When Jehoshaphat and the Israelites were being charged by three enemy armies, they spent their in-between in fasting, prayer and praise. They had to do their part so God could do His part. “This is what the Lord says to you: ‘Do not be afraid or discouraged because of this vast army. For the battle is not yours, but God’s. Tomorrow march down against them” (2 Chronicles 20:15). When Nehemiah accepted the challenge to rebuild the walls around Jerusalem, which had been broken down for 152 years, the in-between started from the moment God birthed that vision in his heart, until the walls were completed. It required a fierce determination to walk the vision out by faith as he went before King Artaxerxes, as he rode out at night to examine the condition and extent of the project, as he tried to motivate the people to join him, and as they began to rebuild facing extreme opposition. He must have sounded like a crazy man. For as I look at each of these instances, that is what the in-between often looks like. A crazy plan. “Lord, let your ear be attentive to the prayer of this your servant and to the prayer of your servants who delight in revering your name. Give your servant success today by granting him favor in the presence of this man” (Nehemiah 1:11). AND YET, it was a God idea! It took courage. It took patience. It took faith. Are you in a place of in-between? “From there he went on toward the hills east of Bethel and pitched his tent, with Bethel on the west and Ai on the east. There he built an altar to the Lord and called on the name of the Lord” (Genesis 12:8). What a promise! And yet Abram left not knowing where he was going or what he was going to do. AND he was going to a land where there was famine. It seemed crazy by natural standards. It was the place of in-between. And yet after Abram obeyed and journeyed into the unknown, just a few years later, he returned to where he had built the altar, only now a very wealthy man. He returned to that in-between place between Bethel and Ai and called on the name of the Lord—for further direction. He had experienced the blessing of walking through the in-between, that unknown place between the promise and manifestation. And he was living proof of the blessing that came from that obedience. Why did he physically return to that altar in the in-between place, because he was ready do it again! He was ready for his next crazy assignment. “Abram had become very wealthy in livestock and in silver and gold. From the Negev he went from place to place until he came to Bethel, to the place between Bethel and Ai where his tent had been earlier and where he had first built an altar. There Abram called on the name of the Lord” (Genesis 13:2-4). There are many now in the place of in-between. You wonder if you are crazy. You are second-guessing if what you heard was truly from the Lord. You may even have people around you taunting you, laughing as you stand in faith and obedience walking through this place of in-between. 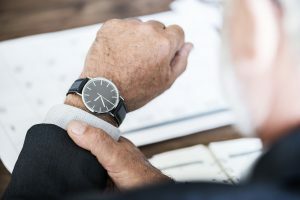 For some, years have passed and you are ready to give up. Don’t! While we pass through some in-between places quickly, others, like for Noah, lasted for years and years. And yet, God was in the timing the entire time. You are about to encounter His face and His favor. The King is opening the door to the manifestation of the promise. “But if we hope for what we do not yet have, we wait for it patiently” Romans 8:25. If you are between the promise that was spoken and the manifestation for which you wait, then the word the Lord would say to you now is to wait. I’m reminded again of the visual of my dog, waiting, in the rain for the squirrel to come down. Waiting, waiting, waiting. But like Abram, like David, like Noah, like Moses, like Nehemiah, if you will walk through the in-between and hold on, you WILL receive the manifestation of the promise! Yes, wait for the Lord” (Psalm 27:13-14).